Does My Web Art have artists or buyers from the Middle East? We do have art collectors from Middle East, and the feedback was very positive as they really enjoy buying art online. It’s [very different from] the traditional art market selling channel of art galleries and auction houses, and they seem to like it. What do you think about the state of fine art market platforms? 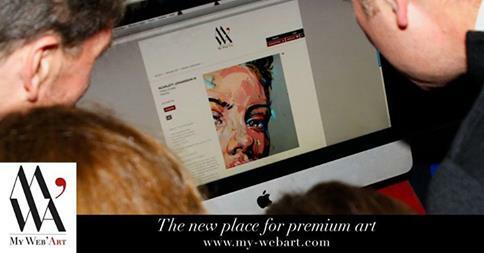 There are quite a lot of art market platforms, but none are of high quality and this is the reason why I have launched MWA: to create a premium platform, with high-quality artists and high-quality artworks. Most of the art websites are opened to anyone, whereas on MWA, we have a selection committee composed of professionals who select the artists and the artworks that will be presented on the platform. The committee ensure the quality and credibility of the artists presented. Sellers also have to pay subscription fees to display works on MWA. With MWA, we are targeting the top of the market and that makes the difference. Other point is that MWA is opened to individual artists, but also to art galleries who display works of their own artists on the platform, whereas most art websites do make a difference between galleries and individual artists. We also promote young artists; I love going to art fairs all over the world. On MWA, we are proud to promote them and offer them great visibility. With rising art markets online, how do you plan to stand out? What is your unique selling point? High quality, high quality and high quality in the choice of artists and artworks. One of our strong advantage is that I know personally each of the artists are on the website. I maintain strong and close relationships with all of them. This is extremely important as I’m able to get to know them, and talk about them and their works to art collectors I meet. We also continue to organize events in Paris, New York, Hong Kong and Dubai, it is important to keep a physical relay and meet art collectors and artists wherever they are, as well as cultural and artistic projects all over the world. With this, our strength rises from our search for artists of great talents, prestigious and trusted partners, close relationships and our international approach in international markets. What do you look for in team? How do you motivate them? Good team members have to be open-minded, creative, complementary and collective. To motivate them, I share my ambition and my objectives, communicate with them as much as possible, give them challenges and opportunities to grow, encourage creativity and support new ideas, celebrate each success, don’t let them become bored, and create and maintain a team spirit.